Last November, the country music superstar suffered a "hard fall" and was forced to take a step back from the public eye as she healed and recorded her latest album, Cry Pretty. And in a new interview with Vulture, Carrie (who is currently expecting baby No. 2 with husband Mike Fisher) revealed just how deeply the accident impacted her—both mentally and physically. "I felt like the differences were more in my head than they were in anybody else's that would listen to the things I was doing," she shared. "I had wanted to be in the studio sooner than I was, actually recording these songs, but I had stitches inside my mouth, outside my mouth. It was physically impossible." She called the experience a "mind game," recalling, "'Do I sound the same? Is my diction the same? Does my mouth move the same as it did before?'" Carrie has since come to terms with the possibility of her vocals changing, explaining in the Q&A, "Things change just as you get older; your muscles change. I kind of expect I'm not always going to sound like I'm 22 coming off of American Idol. Hopefully I get better." This is far from the first time the "Before He Cheats" performer has discussed the accident candidly. In addition to her signature sound transforming, Carrie feared her appearance would spark concern amongst fans. 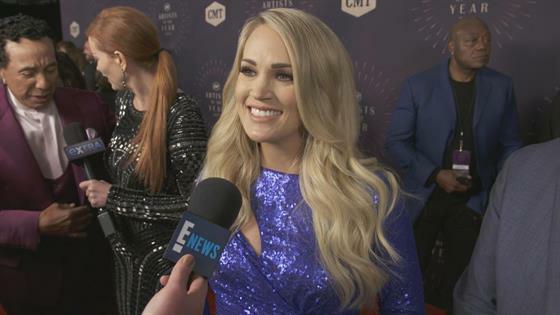 Carrie Underwood: "I'm Just Like Every Other Pregnant Lady"
"I was at a point where I didn't know how things were going to end up," she admitted on The Bobby Bones Podcast. "I didn't know what was going to go on. I didn't know what it was going to heal like." Next week, Carrie will co-host the 2018 CMA Awards alongside Brad Paisley for the 11th time. Is it's a full circle moment for the star, whose fall occurred only four days after the 2017 ceremony.